California Boiler maintains a large inventory of boilers for rent available 24/7 to assist customers who need supplementary equipment or require interim support while boilers are down for repair. 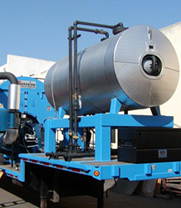 Our fleet consists of self-contained, skid-mounted, and larger rental boilers in a variety of pressure ranges. We provide delivery and full-service installation including all ancillary equipment required for operation and hook-up to natural gas or propane. All boiler rentals are meticulously maintained and meet current California emission standards to ensure maximum reliability and efficiency.